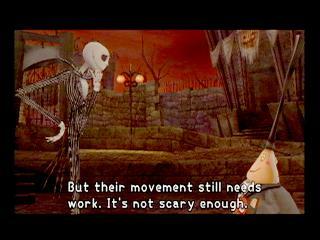 As the evolution of SquareSoft continues, the evolution of video games follows closely. Holding true to the expectations of their reputation, SquareSoft has once again astonished us with their ability to collaborate with other companies to produce a gaming experience that makes the hair on our neck stand upright, leaving us in awe. 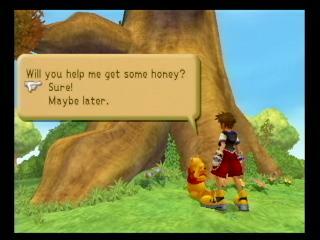 The Imagineers of Disney combine forces with the mighty prodigal video game engineers of SquareSoft to deliver a game that allows us to re-live our childhood dreams of being apart of the Disney magic and gives us the opportunity to interact with the characters we so miss from past SquareSoft masterpieces. 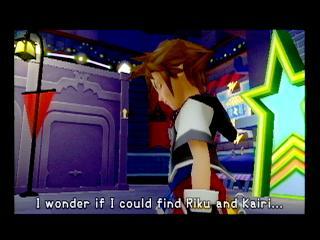 Kingdom Hearts ultimately gives us the power to envision these fantasies. 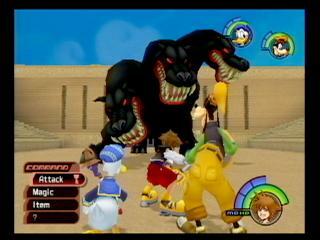 The story is about a young boy named Sora who is mysteriously whisked away to another world where an evil force known as the “Heartless” has decided to conquer. 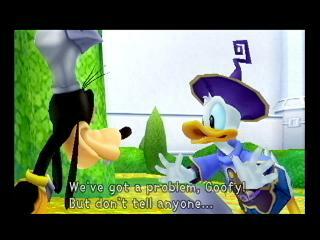 Mickey Mouse has sought out to stop this force and has gone missing. 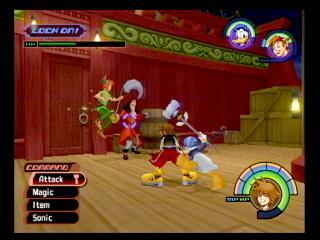 Sora and his friends Kairi and Riku meet up with Donald Duck and Goofy who are searching for him. 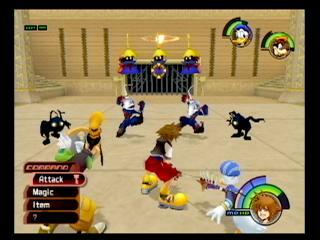 Sora and his friends team up with Donald and Goofy to search for Mickey Mouse and to stop the evil “Heartless” force from completing their conquest. 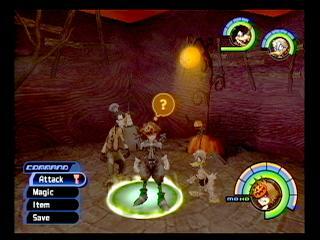 Their adventures traverse through the magical worlds of Disney in search of Mickey meeting many characters along the way, from past SquareSoft games like Final Fantasy’s Aerith to Disney’s Tarzan. As much as I would like to tell you that the graphics were as stunning as those in Final Fantasy X, I must regrettably say that they were a bit simpler with fewer details. But to make up for it, the screen is filled with rich colors and imagination, and animations that make you think you’re watching Saturday morning cartoons. 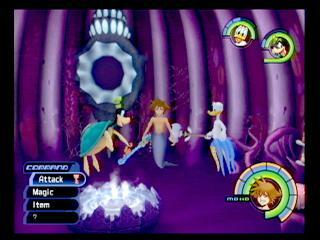 The environments make you really feel like you are truly immersed in the Disney painted worlds that the game portrays. Some of the backgrounds in some of the worlds may have been a bit lacking in design but for every one less-than-appealing background, there was two spine tingling ones that sent you into a state of wonderment. 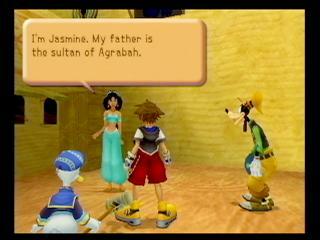 The worlds follow the themes of some of the characters you meet such as those in Aladdin and the world of Agrabah, with its strong Arabic feeling, to those of Alice in Wonderland, causing trouble in the garden of the Queen of Hearts, just to name a couple. The lighting effects are spectacular, helping to create the perfect mood in each scenario you encounter. 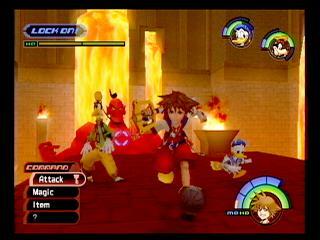 The tropical beach Sora starts off in is bright and sunny, while the caverns of the genie Aladdin, when he is “evil,” are dark and fiery red, and really help to convey the mood and ambience of these imaginary worlds. Just one word: Epic. The intro followed with an awesome song following the traditional Disney performances such as those before a new screening at the El Capitan (Disney Theater in Hollywood) or those at their theme park special shows. 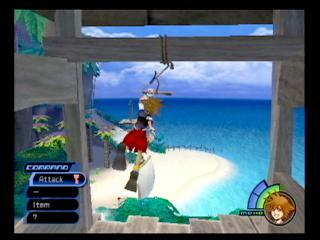 Much of the music in Kingdom Hearts was performed by Yoko Shimamura. The theme, “Destati”, was performed by the Tokyo Philharmonic Chorus and recorded by Toshiyuki Yoshida. Right after I started to play this game, I ran to my nearest Japanese import store and picked up the authentic imported soundtrack. I find myself playing it and relaxing to the incredible sensations of mood in the music. If just listening to the music can bring such feelings of inspiration, I must say it is absolutely incredible to have as the in-game music. 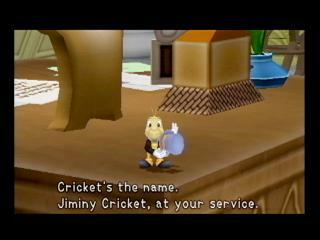 Needless to say, I was impressed, and his music is what SquareSoft and Disney is all about. In addition to the incredible music, let’s talk about the amazing cast of people behind the voices of the characters. Haley Joel Osment (Forrest Gump and Sixth Sense), Lance Bass (N’Sync), Mandy Moore, and Sean Astin (Lord of the Rings and Goonies) were just some of the celebrities providing voiceovers. 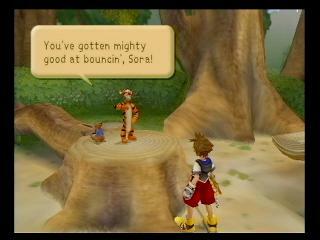 Lip-syncing was also not up to par like those in Final Fantasy X, but is easily made up by its celebrity cast of voices. They really did a standup job to bring believability to all the characters, and they never became too monotonous or overbearing. 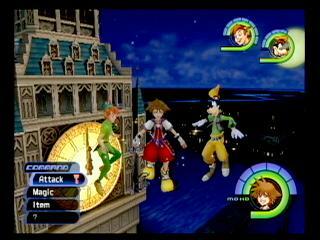 Combining the familiar system of Final Fantasy menus and inventory control, the 3D world freedom of Jak and Daxter, and the action style of Zelda: Ocarina of Time, would be the best way to describe how Kingdom Hearts plays. 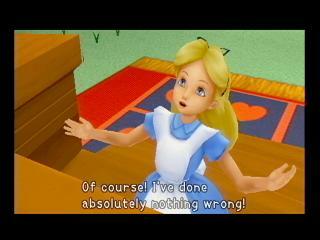 Although the game feels a lot like Final Fantasy, the game is actually all in real-time, like Zelda. 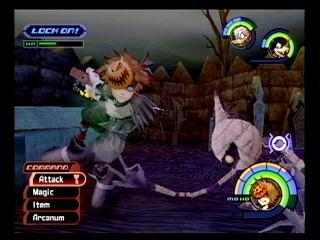 You hack and slash at your enemies either in free mode or with a lock on mode in which your attacks are automatically directed toward an opponent you have selected. Some of the challenges include platform jumping and evading enemies that chase you around in a very exciting world of color and imagination. The blend of all these elements fits very well to a game experience that is really tailored for all ages, and can be enjoyed by just about everyone. One minor disappointment at times was the camera system. Automatic camera angles are a bit lacking, and the manual controls are too hard to constantly nurse, with the occasional chase camera view looking the wrong way or getting caught behind walls and obstacles such as trees. 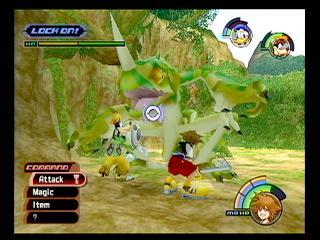 Battle sequences are slightly impaired by the troublesome camera angles but nonetheless, are very entertaining. Like all RPGs, the replay of a game like this would only become relevant after you give the game a rest for awhile, or unless you have other tasks you were unable to accomplish the first time around. 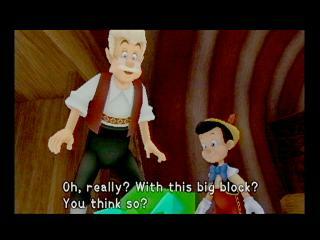 Fortunately, Kingdom Hearts has plenty of mini games that you can go back and try to beat or improve on. This is just the first step of realizing what the combination of truly amazing companies can accomplish. Although the game’s graphics and music were as incredible as you can expect from these two very professional companies, the actual gameplay does get a tiny bit repetitive at times. 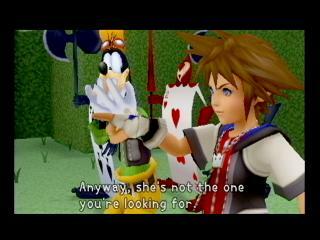 Overall, Kingdom Hearts manages to be an incredible game and definitely another one that stands out from the other humdrum releases on the shelves as of late.